Where the field of Feng Shui and Chinese Astrology be headed. I have no way of knowing. But even judging from our email contacts and the feedback we continue to receive from students alone, we are noting a lot of confusion over way too many misperceptions. In fact, you might have question marks of your own, not so much perhaps to concern of certain alternative explanations, but with regard to such basic tools – or entire systems – as Luoshu, 9 Stars, 5 Yellow, Trigrams, 5 Elements, the Ming Gua system, Ba Zhai Eight Mansions. Thing is, a beginner might soon conclude that a lot in Chinese metaphysics would be ‘anyone’s guess’. You may have seen that – parallel to our study program -, Heluo Qi Explorations has always made sure to publish free articles and blog series and we’d always be as extensive as we can. But publishing has come with a ‘consequence’. Even though sharing articles (I take great pride that these are actually not ‘articles’, but in fact full chapters from out of our class manuals) has been at the core of what we do, we don’t feel we could publish unrestrictedly, which I can tell you has only been an ongoing frustration. But yes, there’s always that friction between what we think we can freely publish about without creating havok ‘out there’ and what goes on once ‘class door closes’ in our private training along either our master class Option 3 or distance learning private training Option A.
Fortunately, I can get things off my chest and find great platform to blow off steam in our private trainings, where we’d tackle exactly some of those standing misperceptions in the field of Qi studies, Wuxing being only one of those. Let me ask you. As a student of Chinese metaphysics, have you taken time to review blood ‘n’ bones – or even the ‘psychology’ – behind some of the standard teachings? So let’s look into that for a change and review some of those otherwise widely ‘trusted’ approaches, but that you too may have raised an eyebrow over. If only because, what if you started practicing to account of an explanation you had once picked up on, but you find out later it was wrong or it needed serious modification? Well, that’s just to concern of a certain explanation and you may still easily adjust and continue your practice. It becomes different once you find that sometimes whole systems or such basic tools as Hetu Yellow River Map or Xian Tian Gua may have been taken from misinterpretation. Or, most disturbing, you suddenly realize how you’d have been faithfully employing from mere decoys, installed by the ‘emperor’ to come to your deliberate detriment (and nothing the ancient Chinese scholar who had something entirely different in mind could have done to avoid it). Then, you’d have to start your studies afresh and chances are, you’d have to – if only – momentarily discontinue your professional practice. To that respect and in so far you hadn’t done so already, I may inspire you to go back to what your sensors had initially told you, when – to name just a few – for the first time you had encountered the Chinese Ming Gua system 命卦, Ba Zhai Eight Mansions 八宅, how you’re supposed to handle Five Elements 五行, Hetu Yellow River Map 河圖, and the list goes on, I’m afraid. If you’re anything like us, you’d have been well into practicing Wuxing Five Elements 五行. You would have been into Wuxing over your head, for whatever purpose, be that for Xuan Kong Flying Star Feng Shui 玄空飛星, Four Pillars of Destiny Bazi 八字, Acupuncture 針灸 or 9 Star Ki 九星命理. ‘Supporting cycle is beneficial; controlling cycle is unfavorable’. Yet, it might just be that still somewhere at the start of your studies – or even ongoing -, you’d have been scratching your head. But. It is where you will have had your questions marks alright, but you had to at one point park those, sort of, if only for ‘later’ scrutiny. Why? Well, it is only natural, simply because not every question or objection we come across in our learning metaphysics can be solved on the spot and our studies and practice will be otherwise of course like a fast moving train, with no breaks. We cannot fall behind, so we leave our objections for what they are, if only for the time being. So, years may have passed, while gradually and along the way, we may have forgotten about our initial ‘ah, how is that so?’ On the other hand, it would be my guess that not would you have forgotton and you’d be still with your initial question marks. Am I right? But, if then you stop the clock for a moment, yes, there’s something itchy about how generically Wuxing will be explained and handled. Not everything may ‘add up’. In fact, most of it will become unsustainable if not it was duly modified, especially and notably so – as an example – if you were to dive into 9 Ki Divination to account of forecasting personal life progression or real events in the news. News events will forever show that you could not have it both ways: and squarely apply Wuxing on its ‘supporting cycle’ and ‘controlling cycle’ and have your 9 Stars and Luoshu forecasting of news events all correct. If you did not receive our email newsletter or or newsletter in pdf directly to your inbox, you may email me heluo@xs4all.nl or simply subscribe at the side bar and receive your copy. To concern of Wuxing and reading personal birth horoscope and astrological personality, character, temperament and behavior through 9 Stars – specifically as you’d mirror your first Star (year of birth) against your second Star (month of birth) in 9 Ki -, Heluo proposes a complementary style as to how to use new Luoshu charting for 9 Star Ki Astrology life readings, much inspired after Six Gods (Liu Shen 六神) and Ten Gods (Shi Shen 十神) in Four Pillars of Destiny Bazi. Five Elements theory plays a role of utmost importance in everything we do, so we want to have it correct, because people rely on our advice. It is because a large portion of our calculations will revolve around astrological compatibility between people, for relationships and marriage, besides we would determine ‘auspicious’ or ‘inauspicious’ to concern of house divination in Flying Star Feng Shui, traveling, position of door, stove, bed or desk. The more if you have been taking your skill to the benefit of others – perhaps your students or clients – it is perhaps time you should hear a different approach, but one that has been there for a good number of years and that you would concur, beats the old doctrine as it is much more plausible and practical. Chances are that you have a long history of calculating annual Stars, or monthly Stars along – say – 9 Star Ki. The year 2013 will be 5 Earth, while February 2013 will be a 2 Earth month, we know that and it bodes no problem. So far, so good and it’s straightforward, and it has been at least already since the late 1970’s when Michio Kushi introduced Japanese Astrology Nine Star Ki to the West. Until Chinese Feng Shui burst out in global hype and around 1995-ish (who’s counting), we meet up with monk Yixing’s Ming Gua system. 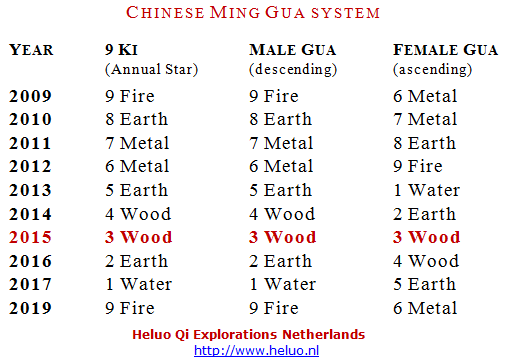 The year 2013 will carry annual Star 5 Earth, just as any person born that year will be 5 Earth, unless it concerns a girl, because Ming Gua has it, she would adopt Gua 1. If a Solar year is 4 Wood in 9 Ki, the boy is equally a 4 Wood, but his twin sister is a Gua 2. As in, he’s an Aries, then she’s a Leo. Then of course, question arises once more, or it should, but that aside. Do you still recall where you were when a certain something happened in the news? Or, like when first you heard about different ‘Gua’ for males and females? I still know where I was when two planes hit the World Trade Center in Manhattan (with my shifu in Canada) and I still vividly remember exactly where I was when Fukushima happened (on my way to fetching my son from school). Same difference, I still know – it just freezed in time – where I was when for the first time I heard someone explain, we should take the annual Star derived from 9 Ki, but then actually change it into a ‘Gua’ if it concerned a girl. Did you have that? I mean, hear that and be dumbfounded? I’d like to suppose so, as it is only natural. But. You would have been dumbfounded alright, but in line still with your ongoing studies and your practice at full swing (remember, fast moving train), did you decide to – if even just momentarily so – park the objections you were seeing, until ‘later’? Ever wondered how exactly monk Yixing (一行僧人 672-717) would have come up with a male ‘descending’ cycle, then a female ‘ascending’ cycle, that happens to conjoin at ‘Gua’ 3? Of course you have, but no-one seems to be able to tell you exactly what monk Yixing had done to come up with that. Practice or denounce? Well, we can’t be sure, because, what if he had done some incomprehensible thing (as he was one of greatest scholars ever brought forth by China, go look him up on your web searches if you have time) which would remain obscure to most of us, but that would actually carry significance, energy-wise? Yes, most will tell you, he had arrived at his formula by intelligibly juggling with the Eight Trigrams 八卦, but it is not so. 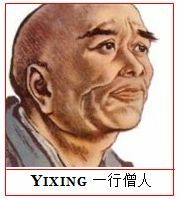 Others will tell you that master Céng Gōng Ān 曾公安 had duly explained how monk Yixing would have come up with a fabrication by ‘inversing the Five Phases by upsetting them in reversed order, in a composite of unclear errors throughout’, which at least shows how Ceng had indeed figured the system was a falsification and all wrong, but incorrect in his presumption that Yixing would have been juggling with Wuxing, because that’s not what Yixing did. Problem being, with meanwhile Wuxing and Ba Gua as your lead, this could have soon inspired you to attempt solve the riddle, and you’d be busy chasing decoys for years. 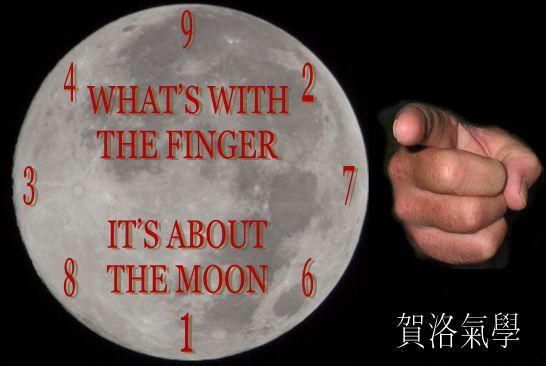 Where both versions are at least honest in trying to unveil that Ming Gua was a deliberate fabrication, if you were to follow such line of reasoning, you’d be focusing on the finger, rather not the moon and you may end up looking to solve Ming Gua, to no avail. Well, for starters, we wouldn’t hold Yixing accountable, because ordered to come up with some sort of falsification by his Tang emperor, but what he did will in fact make you laugh as it is just plain mathematics – shuffling with numbers, comes out – while the ‘formula’ would fit on less than your little finger (and still space for a tattoo). What his Ming Gua did for him, at least, it saved his head from rolling off some cliff. Back to your studies and practice and to account of either applying along just 9 Star Ki magnitudes or your changing into Gua for females, have you felt caught in between two worlds? One that tells you to apply one format, but then as in a split – but just so as to be on the safe side – you’d still reckon with the other just the same? Again, surpassed by far better, redundant and perfectly outdated. Then it’s (probably) not true. We know that. It’s no different in metaphysics, as it should come as a splendid means to help us solve certain matters pertaining time-action-space (or Heaven-Man-Earth, if you will), where we may ponder what otherwise we hadn’t learned in school or in our going society. But, anything going on in metaphysics would still be about the real world, so if initially you thought something was ‘off’, same difference, it probably is. I would invite your investigative mind to come meet me either for Option 3 master class, or for Option A distance learning, to get to the bottom of this. Intensive training along latest insights, to set you aside from others in the field. As I will be here just typing away, here first is brief round up of subjects covered in any of our trainings – be that master class or distance learning -, irrespective of your selected topic of study or the several options we carry, as also, all our class manuals to topic of study will be identical, whatever level you’d step in to train with us. Personality – what constitutes personality, behavior, life progression. Undisclosed – topics of existential interest, we know would remain unexplored elsewhere. H2O – by far the most trusted adjustment used in Feng Shui, whereas we will show you why probably it is best to stay clear from using water inside buildings in most cases. Hemispheres – solving the matter in two paragraphs, max, without ever talking about ‘the other’ Hemisphere, much less magnetism, magnetic needle, compass or anything geographic. Earth Branches – why would we say that Chou Ox, Chen Dragon, Wei Sheep or Xu Dog be mostly read to account of Wuxing Earth wrongly so? Submerged reading – how to read Bazi to account of something that wasn’t in the birth chart. Day Ki Stars – ins and outs on different approaches to calculate day Ki, and will we be able to reach any definite day Ki calendar? Life progression – how to change your personality, character, temperament and behavior and be compatible with all other 9 Ki Stars. Anyway, I guess what I’m saying is, you wish to sail on flawless technique, if not for yourself, then in your professional services, as many may rely on your Feng Shui expertise, your ability in destiny analysis through Four Pillars of Destiny Bazi, character analysis through Nine Star Ki, date selection through 9 Ki Divination, or – even a thing as basic as – how you advise along Five Elements. You want to get things right, but we’re not supposed to blindly apply, as study and practice of metaphysics – just as anything else – comes with trial and error. If you see room for improvement, then work to improve it. If you need to rectify earlier misperceptions, then your doing so – even in face of a client – will be your surest way forward and what will happen is, you’d only have others benefit. See, you’re far more interested to see what the ancient scholar had in mind, than you’d care to be yet applying from red herring, as the last thing you want is to continue yet another day in applying what the ‘emperor’ had in mind. Saying, to debunk and if necessary denounce, requires clarity and courage, and the whole of Chinese metaphysics can only benefit. It is good to learn, then amend whatever fault we may come across in Feng Shui or Bazi, even if it means such basic tools as Hetu and Xian Tian needed looked into, or as Michelangelo said “If people knew how hard I worked to get my mastery, it wouldn’t seem so wonderful at all”. It’s just that, as each one of us will be practicing in good faith, I have a hard time seeing certain those most ‘trusted’ doctrines continue to damage practitioners.